​​​AUSTIN – ​Stick a coin into a newly unveiled vending machine at one South Austin business and you’ll wind up with a lot more than a can of cola or a handful of candy. Instead, expect a new car to pop out. 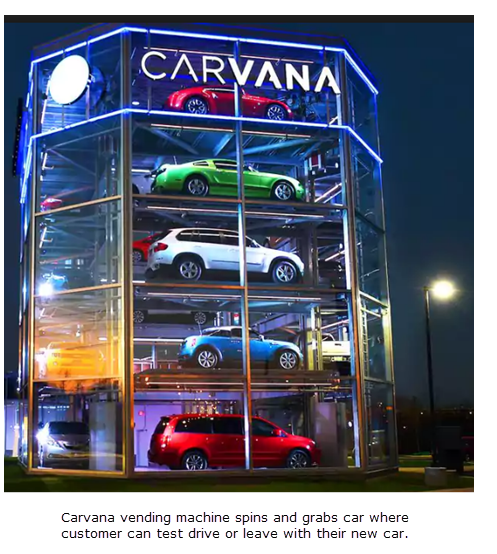 The five-story contraption—one of just three in existence in the United States—debuted at Carvana, 6014 S. I-35, just south of East Stassney Lane. Carvana’s location near Austin’s Motor Mile puts it in close proximity to many well-known car dealers, but its business model is much, much different. The company allows car buyers to shop for a vehicle online at carvana.com, without ever setting foot in a dealership. Once a car is selected, it’s either delivered to the owner’s home or it can be loaded up in one of the vending machines for pickup. Trade-ins can be sold and financing can be arranged through the site, as well. The Phoenix-based company’s other two vending machines are in Houston and Nashville, Tenn.